Molly had been fed Iams all of her life. Notice the yeast on her paws, bad tear stains, bad yeast infection under her rope wrinkle, she even had yeast on her tummy! Although we never had any health issues with her, one day she broke out into an allergic reaction to something. This allergy turned into a severe skin infection. The vet prescribed allergy medication and antibiotics, along with medicated shampoos. After 3 weeks, she improved, but she was still not back to her usual dog, and we were becoming very concerned with how long she had been on these medications. If we did not give her an allergy pill, she would start itching again profusely! After reading what other owners were saying about dog food here in our fourms, we decided to make the switch. We were very dissapointed to find out the we were feeding our dogs a "1 star" food. We chose Avoderm Ovenbaked Lamb & Rice, and sprinkled with bottled "Wild Alaskan Salmon Oil". Within 1 day I had her off the allergy medication. Within 3 days she stopped itching. Within a week her hair stared to grow back. Within 2 weeks her tear stains and paw stains were gone. Within a month she was a whole new dog! I am very pleased with the results of Avoderm and Salmon Oil. The first thing you notice is when you open the bag of dog food, it smells wonderful. Not like grease, like Iams did. It is also light tan in color. No added ingredients that contain dyes. I believe this is why Molly's tear stains have completely dissapeared. Once I began doing heavy research on dog food and trying 10 different brands, I finally settled on the Fromm 4 Star line. All 5 of my bulldogs have very little tear staining, smell great, are energetic, and rarely have any allergy issues. I hope sharing Molly's story with you will help you make the choice to swich to at least a 4 star rated dog food. When I compared the prices vs. the amount to feed each day, it ended up costing very little extra. Less waste to clean up daily certainly helps too! Hi There! Am I gorgeous or what?! Not a tear stain in sight! I smell so good everyone loves to play with me now! Look at how pretty my paws are!!! Look at my beautiful shiny and soft coat! She is so beautiful!! What a HUGE difference, and I bet she acts different too!! Darn that Iams , that is what Vegas was on when I adopted him at 4 months and I kept him on it for another 6 months It was to the point he stunk so bad and was a mess, shedding so bad, he was ate up with yeast, had a severe ear infection and was miserable with itching. Only when I found this site did I learn about food. We switched to Nature's Instinct grain-gluten free Salmon, and within a month he was a different bully. I am still amazed at what a difference a good food makes in your animals, I have preached it to all my family that has dogs, even if their dog does not have problems. What a great testimonial! Miss Molly is super cute!! for Molly! Silva was on Iams as well from her breeder! @KMARINO I would love for you to write the long drawn out version of your story. Maybe your before pictures won't show the difference, maybe they will, but your story is still worth telling! @desertskybulldogs, I have some pretty good before pictures, some even with the open sores on his head, If I took a picture of him today it would look the same with his allergies out of control with the pollen here. I will work on this though. I also have learned that feeding a grain free premium dog food also helps in the tear stains, gas, skin, coat and poop. Better dog food is worth it in the long run. 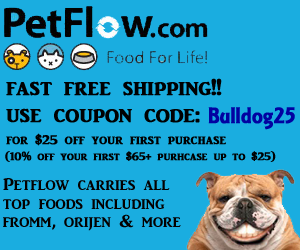 Is it common for a grain free dry dog food diet to have such side effects as weight gain and constipation?